After yesterday’s rather depressing post, many Shoeflyer readers might be looking for an little pick-me-up. My favorite instant pick-me-up is art. The act of creating something, anything–a short story, a new bass line, or an intricate doodle in my day-timer as I wait at the bus stop–is usually enough to lift me out of any funk. Why write about art on a shoe blog? Well, for one reason, because shoes make great canvases. Shoes are often the most expressive part of an outfit because we’re already used to looking at a person’s shoes for hints to their true personality. A pair of black ballet flats with intricate stitching emits a very different first-impression, gut-reaction image than a pair of ravish-me stiletto boots. Besides, I would argue that many pairs of shoes are walking art. One easy way to craft with shoes is to decorate them with stencils, paints, markers, etc. Howard Reingold gives valuable and inspirational advice for would be shoe-painters. He says, “Painting your shoes is a recognizably friendly act that means you know we are all artists of our own lives and not just passive consumers of commodities manufactured by others. Your painted shoes mean you aren’t afraid to be friendly toward strangers.” What a great idea. I know I’d smile if I met someone with Mr. Reingold’s shoes, shown at right. If you’re not the painting type yourself, fear not: the web is stomping with shoe-painting artists who want to beautify your footwear. 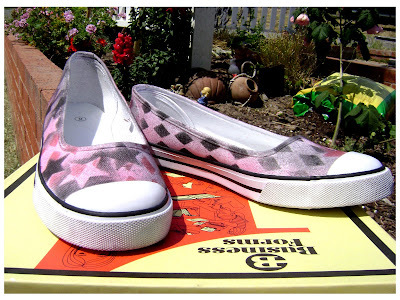 Petaluma at Rock and Roll Crafts will stencil her sweet rock and roll diamonds on your blank shoes for just $25! For a real kick, check out Punk Your Chucks’ array of custom-painted pumps. How powerful would you feel if you stepped out in a pair of these incredibly detailed dragon pumps? This entry was posted on Tuesday, January 6th, 2009 at 8:53 pm	and is filed under Main. You can follow any responses to this entry through the RSS 2.0 feed. You can leave a response, or trackback from your own site.